Earn $1.65 in VIP credit (165 points)What's This? Shimano's top quality Shift Brake Cable Set is an excellent upgrade for your race machine. Includes two cables with PTFE coating for reduced friction and improved weather resistance, two lengths of factory greased SP41 4mm compressionless shift housing, four ferrules and two end caps. Dura-Ace level. 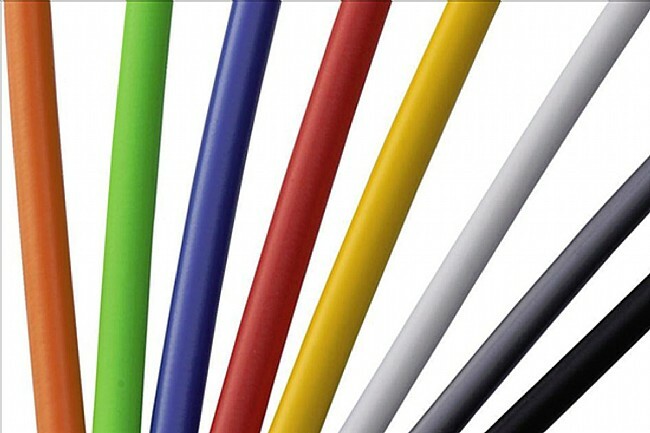 The Road PTFE Shift Cable Set weighs 101g uncut, and is available in various colors. The included housing is specially optimized for newer Shimano Shifters which route cables under the bar tape, but is back compatible with other STI levers as well. Not compatible with Campagnolo systems. Works flawlessly with my Dura Ace shifters and derailleurs. There exist less expensive options, but I find Shimano cables and housing to perform better. And, what would be the point of having nice shifters drive inferior cables? Do yourself a favor and get the best. Used these on Shimano 6700 Ultegra shifters. This is the best shift cabling available, it's just a little pricey so it only goes on my best bikes! I had no trouble installing these cables on my bike. Very similar to the OEM type that came on my Madone.